Things We don’t Like-And You should’nt either! Comments A royal and spectacular talisman! Royal Purple coloured Natural Amethyst from Africa surrounded by 14 dazzling Diamond simulants to create a striking piece of elegant jewellery! Not only has this one made a powerful Saturn talisman, but also a magnificent piece of jewellery! Natural and untreated Africa Amethyst, which is not only totally eye clean and also filled with Jyotish qualities and Saturnine powers! A Saturn talisman of immense powers! Even though this is one of the classical designs it is most commonly referred to as the Princess Diana’s engagement ring design. Seen Below: The lovely princess Diana-Princess of Wales sporting her Blue Sapphire Diamond Engagement ring. The lovely princess Diana-Princess of Wales sporting her Blue Sapphire Diamond Engagement ring. Note: Thank You dear patron for your gracious testimonial. Note: Separate tariffs’ exist for customized ring designs requiring extra design element or higher use of precious metals. This charge is different from the standard tariff that currently exists. For your customized requirements please contact us directly. Note: The above links generally exist on the website for a period of 40 days after which they are periodically deleted to make way for new gemstones and to enable faster browsing. ©1999-2011, Gemstoneuniverse.com, All rights reserved. Gemstoneuniverse-The Gold Standard in Planetary Gemology! 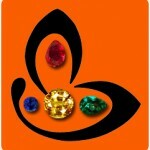 Fantastic guidelines for Gemstoneuniverse.com Blog of Fine, Natural, Unheated Planetary Gems and Jyotish Gems. 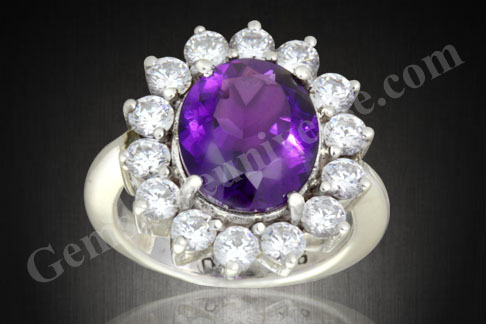 » Magnificent Royal Purple Natural Amethyst surrounded by 14 Diamond Simulants! Natural Amethyst the superior alternative for Blue Sapphire fashioned on the lines of Princess Diana’s engagement ring. http://www.Gemstoneuniverse.com. This is on the list of stones I have been considering for my engagement ring.